A childhood memory that will always stay with me: A BIG thick crunchy dill pickle wrapped in ham spread evenly with cream cheese! Some call them pickle wraps, pickle roll ups, pickle poppers, or dill pickle pinwheels. Use any size of pickle, but 12 whole baby dill pickles work best. Then you spread an 8 ounce package of cream cheese evenly over 12 slices of thinly sliced ham. Roll them up. 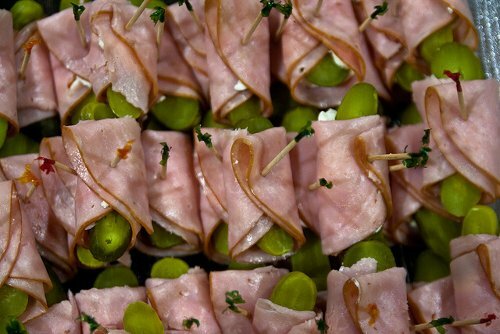 If needed, use toothpicks to keep the sides of the ham wrapped tightly around the pickles. Refrigerate for about 30 minutes, but if you love them as much as I do they will be ready right away!